Keeping metalworking tools in prime condition is essential to the success of metal shops of all sizes. The better maintained the equipment, the more reliable the performance. When working to keep your metalworking tools in great shape, you can’t afford to overlook consistent lubrication. The right industrial lubrication systems ensure that these tools can perform their jobs well and produce clean, accurate cuts. If you’re currently in the market for reliable lubrication, look no further than the high-quality products from MagLube. 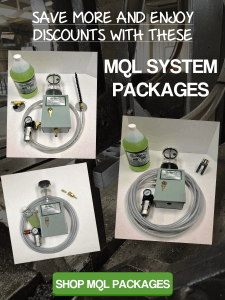 As you’ll find, these top-shelf industrial lubrication systems provide a variety of perks. Anyone on the hunt for environmentally-conscious metalworking fluid is sure to love the eco-friendly lubricants from MagLube. Not only are our oils organic, but they also have a substantially higher lubricity rate than run-of-the-mill cutting oils. The organic nature of our industrial lubrication systems also helps to reduce the amount of disposable waste your tools generate, effectively reducing your business’s carbon footprint. MagLube oils also provide top-of-the-line lubrication. Contrary to what their respective manufacturers would have you believe, many traditional metalworking fluids provide very little when it comes to lubrication. This is because their lubricating properties are typically mixed with 10 to 20 parts water. Our oils and industrial lubrication systems serve to simultaneously lubricate tool components and prevent overheating. High-quality metalworking tools don’t come cheap. That being the case, it’s in your financial best interest to keep your shop’s tools up and running for as long as possible – and our lubricants can prove tremendously helpful in this endeavor. Tools that receive consistent lubrication are far less likely to fall victim to overheating and prematurely-worn components, which ensures a healthy return on your investment. Your metal shop is only as good as the equipment you use – and if those tools aren’t properly maintained, your output could very well suffer. In the interest of keeping your business’s most valuable assets in peak condition, you’ll need to lubricate them with dependable oil – like the industrial lubrication systems from MagLube – on a regular basis. Shop all of our high quality industrial lubricants at MagLube.com today!